Carmel Lancia and Marge Muehlke, co-chairpersons of Thompson-Ames Historical Society’s Rowe House Gardens Committee, are busily coordinating preparations for this year’s “Plant and Bake Sale”. 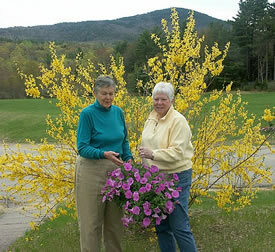 The event will take place Saturday, May 20th at Gilford’s Rowe House, 88 Belknap Mountain Road, beginning at 9:00 a.m. Sales proceeds will go towards continued restoration of the gardens at the c.1838 Rowe House, which is on the NH State Register of Historic Places. The success of last year’s endeavor helped guide this year’s planning.